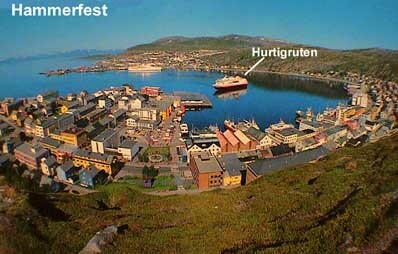 At 5:30 PM, we drove to the Hurtigruten docking wharf to check in and pay for the ticket. 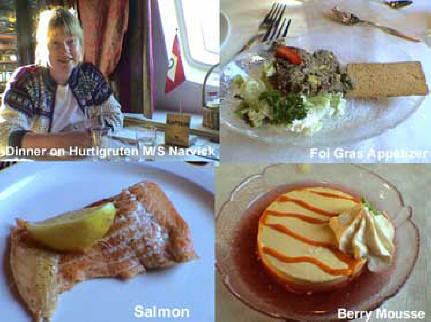 We discovered that this ship was a little different from the Finnmarken we were on several days ago. 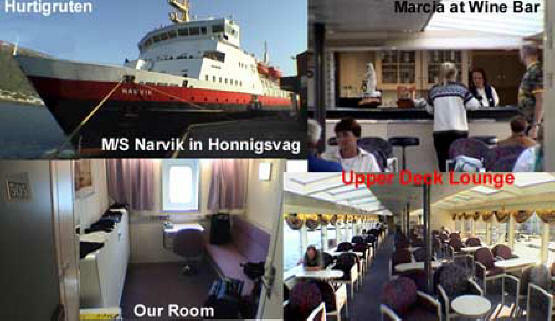 The Finnmarken was the newest ship in the fleet. 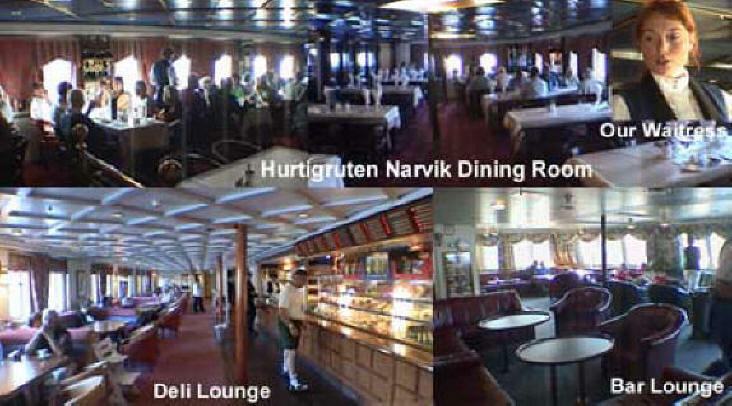 Our ship was the M/S Narvik, is the oldest ship in the Hurtigruten fleet and it will be decommissioned this fall. What luck!! At least we will see the two ends of the spectrum. We waited at the wharf and there didn’t seem to be anyone to check in with, but as long as they were still loading the ship with supplies, we didn’t panic. Missing this ship would have put us in a terrible bind. I finally walked over to one of the loaders and asked him what to do. He told me to just pull the car up in line and since we were the first, we made the line. 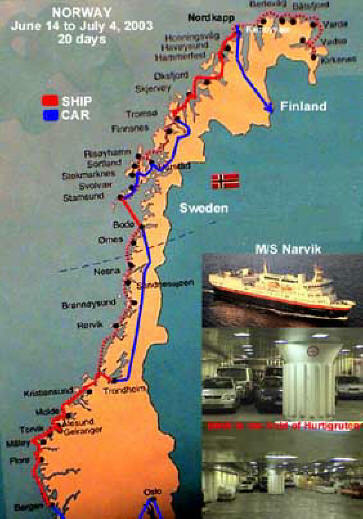 By 6:00 we drove the car onto the ship. You pull the car onto this ramp which is at first at an angle and then it tilts flat and becomes an elevator which lowers it into the hold and then you drive off it when it is flat with the floor. It is an experience. We take our bags out (without anyone to help us) and they take the car to park it. Climbing through heavy ship doors to find the elevator to the main deck was also a little taxing. We checked in at the Bursar’s desk and they told us where our room was on the E deck. Now we had to walk to a deck outside and traverse half the ship to enter the next inside area where our room was. It had gotten pretty chilly and windy so we were not too pleased we had to go back and forth via this route. The room was nice enough and we unpacked. 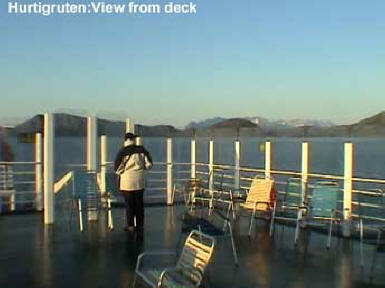 We headed back to the main deck floors just as the Hurtigruten departed Tromsø at 6:30. 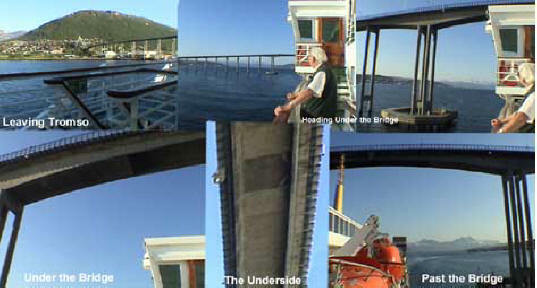 We then went on deck to watch as we went under the big suspension bridge which was quite a sight. Above are some of the beautiful sights along the way. At 8:00 we went to the dinning room (below) and the waitress found us a nice table. We discovered since they had a Spanish wine we would share a bottle and then we enjoyed a foie gras appetizer followed by a dinner of salmon, potatoes, salad, and a berry mousse for dessert. The menu was pre-fixed so we had no choice and we both ate the same thing. After dinner we explored this old tub and realized the dramatic difference from the luxuries of the Finnmarken. We did a stop in the port city of Skjervøy and watched as they exchanged passengers and shipments. 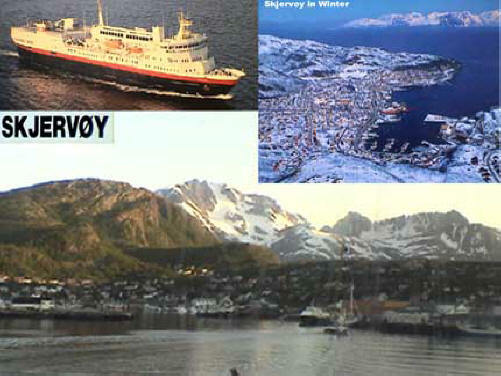 I bought a postcard of what it looks like in Skjervøy in the winter snow. We went to the bar lounge around 10:00 and found a window seat and I worked on photos and video. Later we arrived at the city of Hammerfast (stock photo below) but it was a little too dark to see it. All of a sudden it got very foggy and dark. This was unusual since the sun is always up and bright all night long. It was very eerie and I felt a little ill at ease. 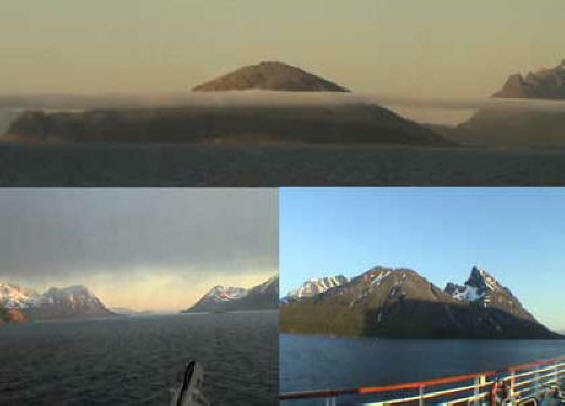 Maybe the thoughts of ships sailing in dead fog were on my mind. Marcia seemed a little quiet as well and she finally went off to the room. I saw a ship in the distance and as it got closer I could barely make out the name on the side due to the fog. 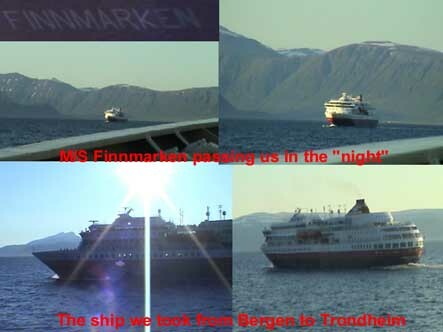 Lo and behold it was our Finnmarken, heading south from Kirkenes on its way to Bergen (below.) It was a beauty to behold. At 12:30 I decided to go to bed also. I kept feeling queasy (not seasick, I don’t think) and it took me a little longer than my usual 10 seconds to drop off to sleep.